There are many beautiful hairstyles for prom that you can choose from if you want a special, romantic look for this magical night. Classic ringlet curls are a popular style, and you can leave the curls loose around your face or pull back the sides in a half updo. Bangs will help frame your face, as will leaving a ringlet or two loose and wispy. If your hair is naturally wavy, take advantage of that texture with a romantic, loose prom style. You might choose to pull the sides of your hair back into a half updo, or just use a pretty clip to keep the hair back away from your face. This is the perfect hair style if you have a strapless or spaghetti strap dress, since your hair will fall to your shoulders and complete the elegant look. The classic prom updo is always a popular formal hair style. The updo should be styled at the rear of the head, with the hair slicked down across the forehead in a faux bang swoop or else pulled straight back across the crown. 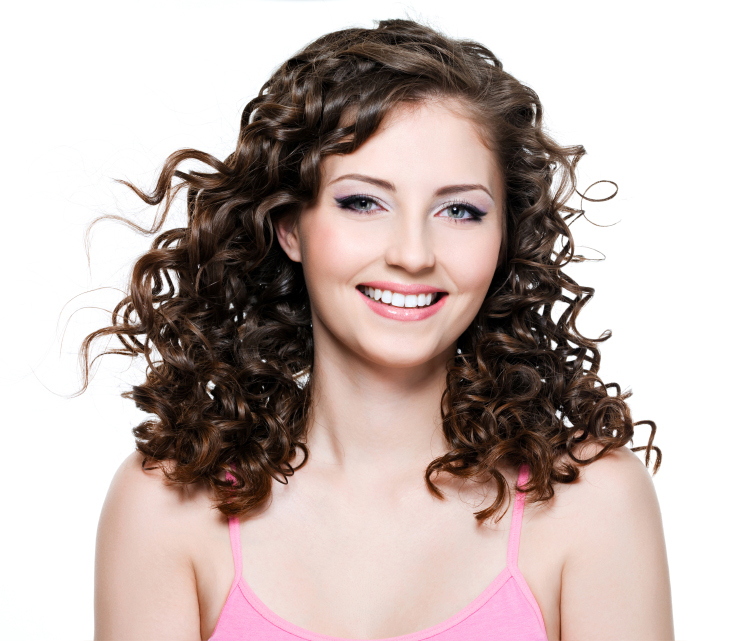 The hair can be curled in the back, and one or two ringlets can be dangled free to frame the face. If your hair is short or medium length, an elaborate updo can be difficult to create. Instead, consider a sleek, chic low bun at the nape of your neck, using a side part to give the look some definition without elongating your face. Accent the look with a jeweled barrette or flower on the side for an elegant finish. If you don't want to take the time for a full updo style, consider an easy half updo instead. Part your hair on the side and pull small sections of each side back and fasten them with a clip that coordinates with your dress color or prom jewelry. This works well with straight hair, but if you want a bit of curl use a curling iron to give the bottom few inches of your hair a gentle wave. Braids might seem like everyday hairdos, but you can easily create a braided updo for a fantastic prom style. Plait two or three sections of your hair, then coil the braids along with the unbraided hair into a textured updo. Drawing one of the braids across the crown of your head will help keep the style under control and draw attention to the unique look. A classic chignon or French twist is an elegant look for prom that you can't go wrong with. This is a perfect style for girls with fine or thin hair that won't hold curls well, but it is still a sleek, sophisticated look. This style works especially well if you have a dress with a high neckline and you don't want to obscure the fabric or details with a long hair style. Give your prom updo some an edgy look by using straight, tapered bangs instead of smoothing your hair across your forehead. Adding peek-a-boo highlights to the bangs will also help them stand out and will draw attention to your eyes. An updo doesn't need to be stiff and structured to be beautiful. A messy updo has lots of body and texture that can look great for a semi-formal event or a casual prom. If you want to wear the look more formally, add a jeweled hair pin or clip and choose elegant jewelry to match. If your prom has a retro or vintage theme, choose your hairstyle to match. Elegant updos, twists, pin curls, and ringlets are all great vintage looks that can be perfect for your prom and will show off your natural elegance and classic beauty. You can make simple hair styles for prom stand out with creative color choices, such as two-tone hair color. Be careful when experimenting with radically different colors, however, because you want to be sure you choose the right hair color for you, and be aware that some school dress codes won't permit unnatural hair colors such as pink, blue, or green. If you do choose to try a bold new color, do so well in advance of prom to be sure you like the look for you special day. Coordinate your prom hairstyle with your dress by finding ribbons in the same color and weaving them into braids, updos, or twists for a bold and colorful burst. This is a great way to draw attention to your hair style without needing a hair color change, and you can easily rearrange the ribbons for different looks if you can't find a prom style you like. Carefully placed hair highlights can make your color stand out for prom, even if you don't choose an elaborate hairstyle. Opt for simple, smooth highlights just a few shades different than your natural color, and have them blended in to your hair for a sophisticated color change. Many African American prom hairstyles focus on elaborately sculpted updos and rigid curls, but you can show off your hair's natural beauty with a simple loose style. Use a good conditioner and eat a diet for healthy hair to get your hair in great shape before the prom, then let your locks speak for themselves. A sleek, simple hairstyle can be great for a prom as well. If you have short hair and don't want an elaborate change for your prom look, just get a neat trim for an understated, chic look. Use a smoothing or shine serum for sleek sophistication. Focus on framing your face and coordinating your jewelry and makeup for an overall prom look that will dazzle your date. Add a royal touch to your prom style with a simple tiara or other jeweled hairpiece. Clips, barrettes, hair pins, and head bands are all popular choices, and you can find them with crystals, rhinestones, feathers, flowers, pearls, and other accents. Choose a style that will match your dress, and work to find a hairstyle that will show off your prom accessory. See Pics of Perfect Princess Prom Hair for more royal hairdo suggestions.